I've finally got my laptop back after it was totally scrubbed and am in the process of loading EVERYTHING back on it. ugh! ;-( Hope to be operational for next week's game though. Computer viruses are both costly and time consuming! I was able to retrieve a working copy of SOWGB and am installing it when I come back form work tonight - so I should be good to go! Phil - bravo. Look forward to seeing you back in the saddle soon. Roland - excellent news. So we will play Reisswitz today, which means Mike can join us. Have put together an embryonic scenario on the new Cold Harbor map. Will now do a bit of testing on it. This one is coop vs the AI, as I doubt we'll get more than about 5 players. You will need the Cold Harbor map mod, and an updated version of the Reisswitz mod which I'll post later today. So far we have Roland, Mike, Digby and Martin, with Kevin as a possible fifth player. Any others welcome. Any volunteers for CinC? You will not need to directly command any troops. What time gentlemen? I can do 19.30, 20.00, or 20.30 (UK time), with a marginal preference for the earlier times. But only marginal. I can do any time. Earlier is better for me as well. Name the time and I shall be there!! Your loss then I was busy chatting with some Austrian on facebook and watching a Toucan out my office window now you will suffer the most casualties. Shall we say 19.30 UK time gents? My only observation from yesterday Martin was that you have the limbered gun sprite appear instead of the unlimbered one when you capture an enemy gun. I thought artillery was better but still not that effective. Is the intention to make it less effective than Napoleonic artillery? I know many focus on 1870 to justify a powerful artillery but just 4 years earlier the Prussian artillery was considerably less effective even though it was exactly the same equipment; their doctrine wasn't developed. I wouldn't think 1870-effect artillery wouldn't be much fun but I feel it ought to be a bit more punchy than what we have now, unless you allocate more than 1 battery per division - that may be the issue. From the enjoyment of the game last night I see no need to move the Reisswitz mod over to SoW:WL - the lack of AI squares is a god thing I think. Yes it is. Our existing mods make c50% of casualties due to artillery in Napoleonic, and 25% in ACW. I've provisionally aimed for the ACW figure here. Artillery was of course better in the 1860s than it had been 50 years earlier. It's just that the improvements in infantry firearms were relatively more useful, given LOS limitations. Generally agree. For this mod I'm more thinking 1859 Italy and 1866 Austria, than 1870. Also by 1870, the ability of cavalry to make a successful charge was clearly on the wane, so that's another reason to go earlier. I think we should test more with the guns. I'm certainly open to modifying it further. The more open European battlefields may mean the ACW comparison is not quite right, but if not, in which direction? Yes, that was my impression too, pro-tem. On my front the AI cavalry behaved pretty sensibly most of the time. Yesterday's game vs the AI was tough for the players, as there was no intel on the enemy force, which turned-out to be almost twice our size. The stated objective was to march E, seize the town of Chalons, and secure our LOC to it. The real objective was to withdraw the army in some degree of order, once the adverse odds became apparent. We managed to achieve this........well more or less. This was not easy and credit is due to all, and particularly Roland, who was in overall command. I will remember yesterdays scenario as "Bad Day at the Office" Tons of fun once again! Another Reisswitz scenario tomorrow at 20.00 UK time. Details and a doodle later. Martin - maybe a quick update to fix the captured guns? Yes I've already done that in my copy, so it will apply during tomorrow's game. I didn't want to give folks the bother of downloading what is now quite a large mod, for such a small change. Am planning a few more enhancements, so will bring out a new version shortly. It is 16.00 hours on 5th September 1866. After a long period of peace in Europe, war broke out between Blue and Red in the spring. Initial advances by Red have been repulsed, and Blue has taken the fight into Red territory. We briefly raided this province a month ago, plundered the town of Landschut and damaged the major bridge over the Leider River there. As it turns out, we now need that bridge! Further to the east, our III and VII Corps are moving N against a major Red army. Our task is to rapidly move NE and join this force. The Red forces here consist of a corps under General von Winterfeldt. This includes infantry divisions under Ruhmohr and Leyden, and a cavalry division under Lobkowitz. Although he may somewhat outnumber us, his force is believed to be somewhat disorganised, and widely dispersed. 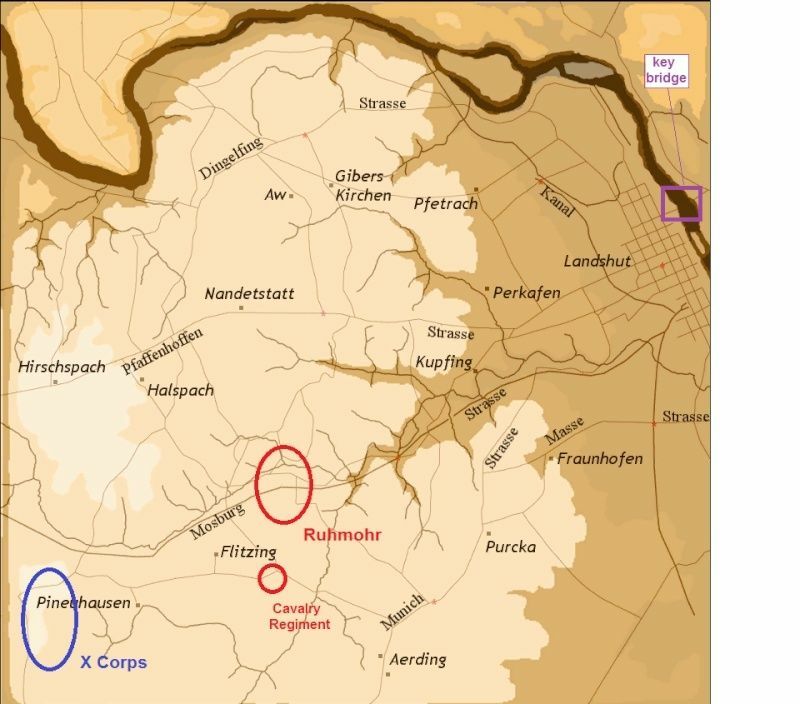 Ruhmohr's strong division is reported astride the main Mosburg Strasse, to the NE of Flitzing. There is believed to be a regiment of cavalry on the parallel road to the S. There are no doubt other forces further N and perhaps also in Landschut itself. However Winterfeldt's corps is not your objective. It is essential that you cross the Leider tomorrow morning and join our two corps operating east of the river. To do that you need to seize the bridge by dusk (19.00 hours). This will enable your engineers to repair it overnight, and allow your main body to begin crossing at dawn tomorrow. If you can avoid a major fight, you will be in good shape to participate in the crucial battles further east. I will send a more detailed briefing to those who let me know they are playing. There will be time for a brief pre-game team chat, but do feel free to chat beforehand if you wish. That's great Diggers. Can you express any time preferences on the doodle please?